I used to have at least 15 minutes after shower to put on my make up. That was before I have my 2 kids. Nowadays, I have 10 minutes max, including shower time before the 2 monsters come screaming and pounding on my bathroom door. 10 seconds late in opening the door and I swear the door will see a hole through it. 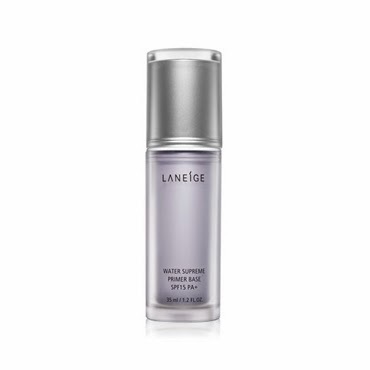 If you're looking for a short cut to healthy, bouncy skin, try Laneige Water Supreme Base. I have been using it for almost a year now and it works wonders on my dull skin. It's great for mothers like me who barely has time to put on full make up but still wants a great looking skin with minimal efforts. I am using the purple one. Just like the name suggests, it doesn't only act as a base to hold your foundation but it helps to maintain moisture on your skin, resulting in supple and translucent skin. It also has SPF 15 to block out harmful UV rays. 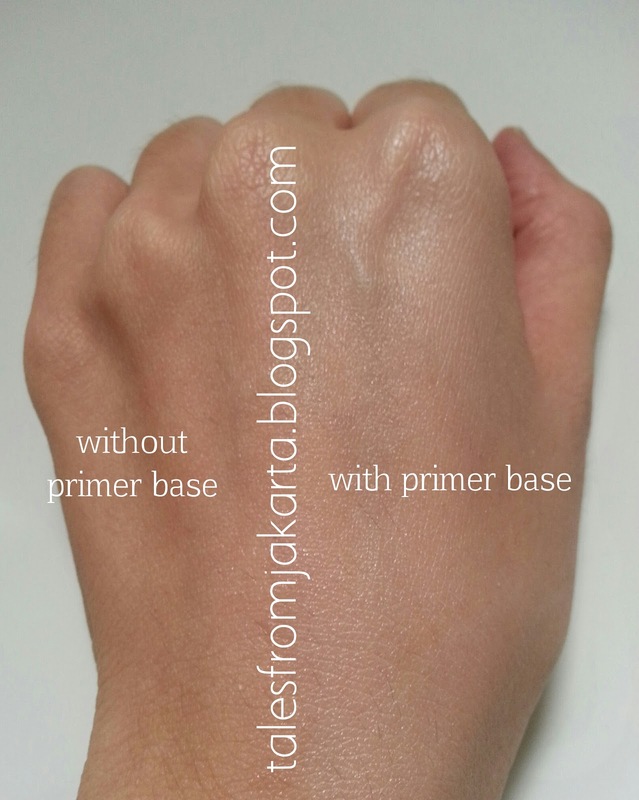 After a light moisturiser, I apply an even layer of the primer base (2 to 3 pumps) all over my face and neck. Due to its watery texture, it doesn't feel sticky on my skin. Yes, that's my dry looking hand. Evidence of brighter, dewy skin. I hardly use foundation nowadays (unless for special occasions) but I replace it with loose powder, just to set a matte finish on my skin. After that I use an eyebrow pencil to fill in some mahagony brown onto both eyebrows and dab on some tinted lip balm on the lips. Now, here comes the downside. 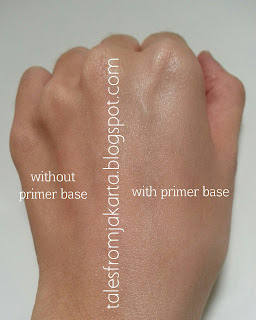 It is too sheer to be able to cover any blemishes unlike BB creams. Its function is to achieve radiant looking skin. If you've dry skin, this product is definitely for you.